oday I had a 40% off coupon at Borders. I also have tons of things on my many Amazon wish lists*. What I wanted was a way to quickly print out my wish list, but without all the crap that Amazon has on their webpage. All I want is the title, author(s) and price. No graphics, no tables, &tc. I had about an hour before I had to head out the door. I thought: This is a job for Automator, surely. And it was. With time to spare, I found the item to grab webpages, figured out how it parse webpages into paragraphs, and then monkeyed with a custom python script enough to make a reasonable list that was ready to print. Worked great. When I got home, I added a few extra things to clean up the text some more and fix a bug or two. Much later, I made sure it worked if you were an anonymous user or a logged in user, and made it work with CD/DVDs, and other products. You can download the script: Amazon Wish List to Text (let's call this version 1.0). Update: 8/19/2009 In case anyone is wondering: This version no longer works due to a formatting change at Amazon. I'll sit down and write a 2.0 version if you don't write one first and post it to the discussion below. 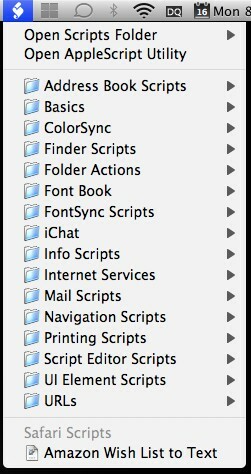 Enable the script menu, if it's not already there (in the upper right hand side of the menu bar): Run the AppleScript Utility, often found in the /Applications/AppleScript folder. Check the "Show Script menu in menu bar" checkbox. Quit the AppleScript Utility program. 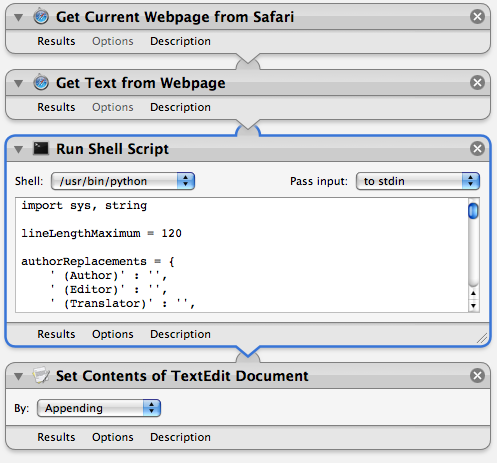 Open the Safari scripts folder, by going to Open Scripts Folder > Open Safari Scripts Folder in the scripting menu. Place in script, and close the scripts folder window. At least currently, this only works when viewing lists in the "Normal"-sized view. The workflow requires that the wish list Safari window be the foremost Safari window, and it will append the text into the foremost TextEdit document. I did that so I could allow multi-page wish lists to keep appending to the same TextEdit doc until I was done. If TextEdit isn't running, it'll open and start a new document with the text. In the current version of the script, multiple authors are only listed by last name, but single authors get their full name. Prices are rounded to the nearest whole dollar, if available, and there's a 120 character line limit (the whole line, price, authors and all). You can change the length easily at the top of the script. Just double click on the script to bring up Automator. Change the value, then save. * I only recently decided to break up my list of over a hundred unorganized items on my wishlist into many sub-wishlists, giving meaningful names to each list. My main worry is that almost no one who goes to see someone's wishlists thinks to look at the left of the page to see if that person has other wishlists that are public. I hope Amazon fixes this. What a great use for Automator! I modified the script on line 68 to not print the price, and I used the output to give to people as a books wishlist via email. Much easier for them to read than browsing 10 pages of Amazon with US$ all over it (I'm in Australia). This is just what I need. ITs the first time I've used automator and I managed to followed your three "easy access" set up instructions, but I don't know what to do next. How do I make the script run? I've tried choosing print from the Safari File menu, but that didn't work. Hmm…. Braidwood, in the upper-right hand corner of your screen you should see a little icon that represents your Applescript Menu (I'll include a screenshot here). Selecting the item shown there should run the script. 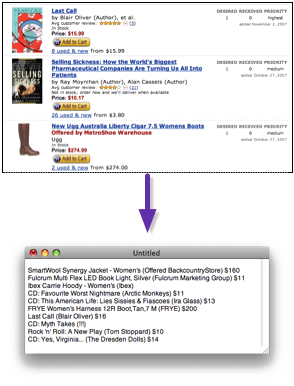 After you select / run it, switch to TextEdit and see if there isn't a plain text list of what is shown for your Amazon wish list in your browser window. Keep in mind that it will append the text to whatever is the currently opened document in TextEdit. When making a fresh list, I usually open a blank document, then switch to Safari to run the script. For those following the RSS feed on this page, Amazon changed the formatting in the wish list page, so a new version of the script is in order. I'll sit down at write it when I get some spare time (unless someone wants to write it first and post it here! ).